Do you need more time? No matter who you are, you probably don’t have enough of it. Time is a limited resource and it’s constantly running on empty. You can’t stop using it and you can’t find more of it, but you need it to do absolutely everything. From scheduling meetings to fulfilling orders, time is behind every aspect of running a business and you can’t afford to manage it poorly. Ineffective time management can take many forms. Whether it’s procrastination, personal distractions, or projects that take more time than they should, there are tons of different things that waste our time every day. Wasted time means rushed deadlines, a work-life imbalance, and more stress and anxiety. When it comes down to it, you don’t need more time, you just need to use the time that you have more effectively. Thankfully, opportunities to manage your time better are everywhere. We found the IAmProductive app, perfect fit to help you free up your schedule, find time for your personal life, and focus on getting your work done. IAmProductive is a time management and productivity app, designed and developed with the purpose to help users become more productive, efficient and more mindful of where their time is spent. Time management and evaluation is an important thing if you want to stay on top of your work, personal and social life, while staying productive at the same time. It’s a daunting thought - having to assess and reevaluate where all your time goes as the chances are that you, like many of us, most certainly end up spending too much time on unimportant little activities like watching YouTube videos or scrolling through your Instagram and Facebook feeds. Our time is limited. There are only 24 hours in a day and even if we like to think that’s more than enough, often time likes to prove us wrong. That’s why being in control of your unproductive time-wasting habits can be an amazing thing. IAmProductive help us track and manage all of our tasks and evaluate where most of our time ends up being spent. The tasks and activities are sorted into three categories: productive, unproductive and miscellaneous. You can also add your own custom tasks and rename them or the pre-existing ones. When you start with a task you just tap it and the app will begin tracking the time you’ve spend on the task. You can stop the timer when you finished the task. Stats in the form of daily, weekly and monthly formats are then presented to the user. The IAmProductive app can be the perfect tool to boot-start your new productive streak. 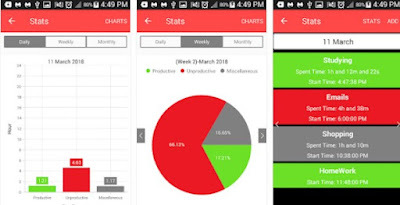 If you were searching for a productivity or time management app to help you get more organized and productive you can find and download the IAmProductive app for free from the Google Play Store and the App Store today!